Several years ago, when I managed the Baxter Branch Library, a young woman strolled in, plopped down at a computer and began scrolling through Facebook. She was dressed in slouchy flannel pants, an oversized t-shirt decorated with a picture of Garfield the Cat holding a coffee mug that said I DON’T DO MORNINGS and fuzzy slippers. In other words, her pajamas. I didn’t say anything. The library didn’t have a dress code for patrons, as long as they were decently covered, which this young woman was. She wasn’t creating a ruckus and when her time limit on the computer was up, she left. Leaving me to wonder where she was headed next. Post office? Grocery store? Bank? Home to take a nap? Flash forward a couple of years, when I began taking novel-writing classes near Sweetwater, Tennessee. My motel offered free continental breakfast in the lobby. Families with small children often crowded the eating area, and sometimes those children were dressed in pajamas. No big deal. Cute, in fact, up to a certain age. But as time passed, I began noticing a fascinating phenomenon. Little kids weren’t the only ones coming to breakfast in their pajamas. Teenagers were doing it, too. And so were their parents. Flash forward again to just last month, a couple of weeks before Christmas right here in Cookeville. I circled the K-Mart parking lot, hoping to find a spot that would allow me to dash in and get what I needed without burning a lot of time. It was one of those strange, pleasantly warm December afternoons and I noticed a cluster of people gathered near one of the buggy corrals, laughing and talking and smoking cigarettes. Not unusual. Except for how they were dressed. Yep. You guessed it. Pajamas. When did this become okay? Did I somehow miss the announcement that it’s appropriate for grown-ups to go out in public in the same thing they slept in? Maybe I’m too proper for my own good, but I still feel a little hesitant about putting on my pajamas at home until I’m ready to crawl into bed. I won’t walk out to the street to get my newspaper on a Sunday morning unless I’ve got a long coat—not a bathrobe—covering my pajamas. At even at that, I look both ways to be sure none of my neighbors are out getting their own newspapers and that there’s no car in sight. Then I sprint to the end of the driveway and back. I can remember back to the 1980s when people first began wearing exercise clothes outside the gym. Remember jogging suits? Parachute pants and jackets? Though ridiculous-looking in fashion hindsight, such outfits were not inappropriate for a trip to the grocery store. Next came yoga pants, which sometimes stretch the limits of good taste when worn in public. Then leggings, cute as can be under a dress or long tunic but always awful when wore as britches. 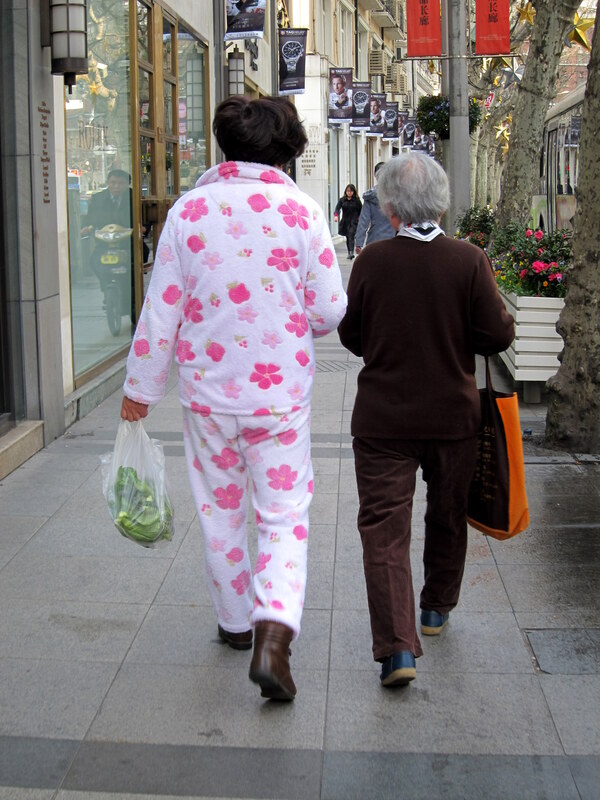 Worse, in fact, than most pajamas. 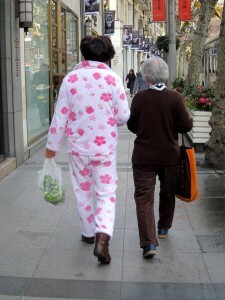 Just for grins, I decided to write the first draft of this column while wearing my pajamas. On one of those glorious Christmas break mornings when I had nothing on my calendar, I got up a little before seven, fixed a pot of coffee and settled down in front of my computer. Not half an hour later, somebody rang my doorbell. I threw on a long coat and went to see who it was. Would that I had pretended not to be home. But that’s the subject for another column.